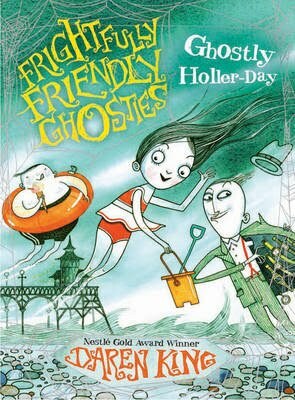 It's winter, and what better than a ghostly holler-day by the sea? But how are the ghosties to decide between Frighten-on-Sea and Scare-borough? A postcard from their friend Headless Leslie decides for them: Headless is in Frighten and cannot remember how to get home. He wrote the address on the postcard, then he forgot what the address was. So the friends set off on an exciting ghostie caper; involving a haunted Frighten pier, a fun fair, and a mysterious phantom magician. But will it all end in spooky fun or devilish disaster? And will Leslie keep his head? This cover is really good. To be honest, I think it could use a little more colour because it doesn't stand out very well. I do understand that it is a ghost book though, so I know it needs to look a little dark and spooky - but a little more colour would be a great improvement. The picture above doesn't do the book in real life, justice. In real life, the spider webs are shiny and spooky; you can hardly see them on the picture used for this review. Other than that, I really do like this cover. It's very mysterious and it just makes you want to grab it and start reading straight away! The characters names in this are ridiculously hilarious! Charlie Vapour, Humphrey Bump, Pamela Fraidy, Wither, Headless Leslie....to name a few. It's clear that the author has spent a long time thinking about the characters names and personalities - by the second page, you feel like you already know them! This is a very unusual, unique, original book. A family of ghosts living in a house that is no longer occupied by the 'still-alives'. Of course, that is not all the book is about. It's a story of fear, haunted piers at night time, con-men, spooky Victorian magicians, strange trap-doors and lots more...mwahahahahahahaa! Also, I love the authors play-on-words. Frighten, Holler-Day, Scare-borough....basically the whole book is hilarious; it's a must-read! I have only found ONE fault with this book and that is about the ending. The ending is extremely disappointing - it's as if the book has just stopped in the middle of the story. I would have liked a more detailed, dramatic, clear ending. Other than that....wow. That's all I can say. Wow. This book was great! I absolutely loved it. It's not extremely scary so I'd say this book is for readers aged...7+. Maybe even younger, if this was read to the child. I give this a rating of 4/5 - excellent :) I've never read anything by this author before but I certainly will be reading more by him now!